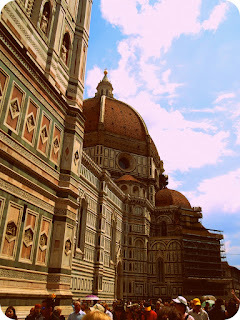 The best way to get acquainted with any city or town is through local food. Tofino, although a small coastal town, is populated with famous restaurants. From the world famous Tacofino food truck to BC favourite, Shelter Restaurant. 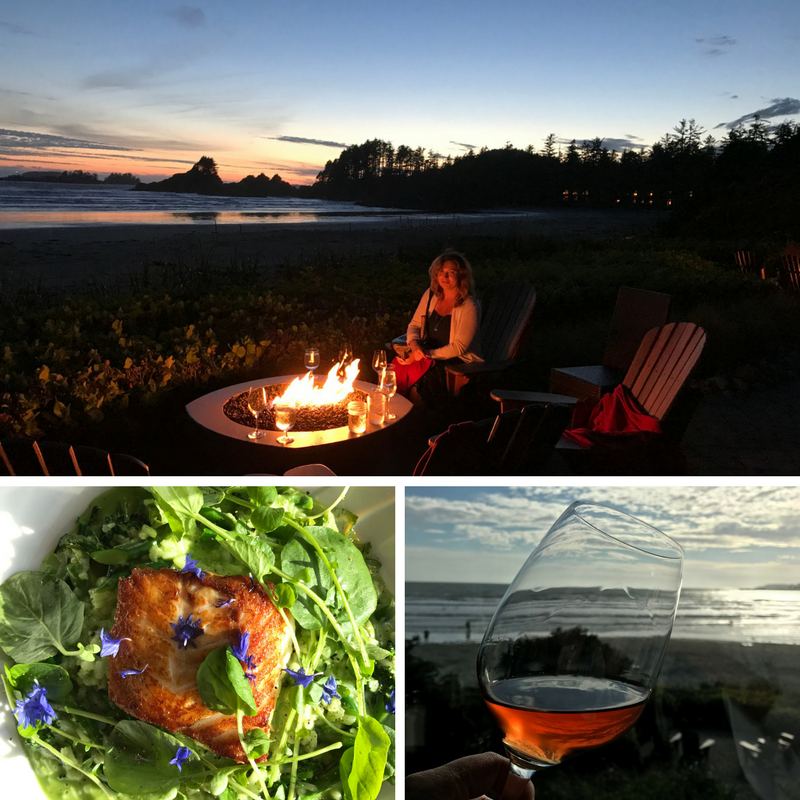 Tofino is even home to one of Canada’s top 100 restaurants, Wolf in the Fog, it’s a culinary jewel in a rather remote location off the West Coast of Vancouver Island. 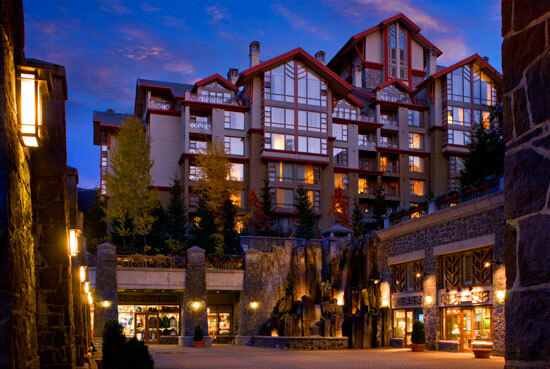 From Kelowna it is a long 10-11 hour journey by car and boat then car again along winding roads that line ancient forests, lakes and the Pacific Ocean. Tofino offers some of the best seafood I have ever had as well as the best taco that has ever graced my taste buds. Hands down! During my blogging hiatus one of the things that kept me feeling guilty was not yet having conveyed to you, the readers, of the delectable culinary offerings I had the opportunity to explore. 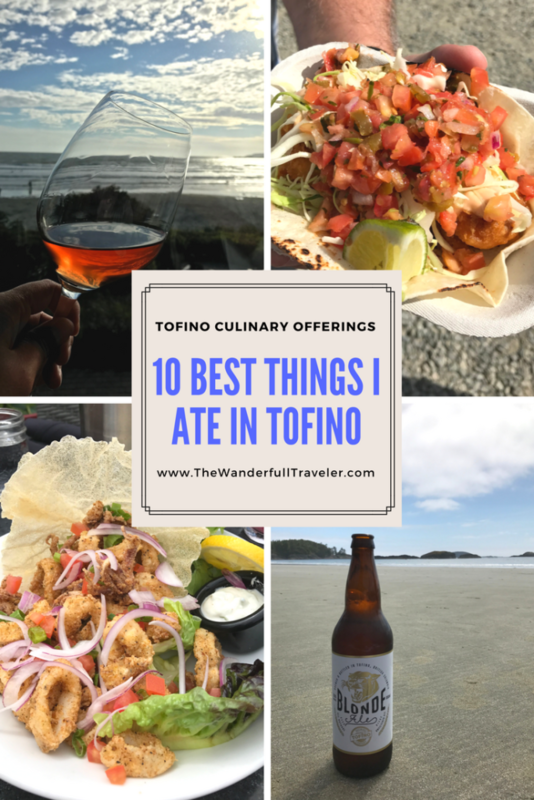 I, with total excitement and enthusiasm, share with you the 10 best things I ate in Tofino! After a freezing cold journey, at the end of June I might add, on a semi-successful whale tour, Shelter Restaurant was calling to me. Conveniently located across the street from Jamie’s Whaling Station, I sat down in the cozy bar fitted with wooden interior and edison lighting above our shivering bodies. A spicy Ceasar was in order, a Canadian classic, as well as the Salmon BLT. 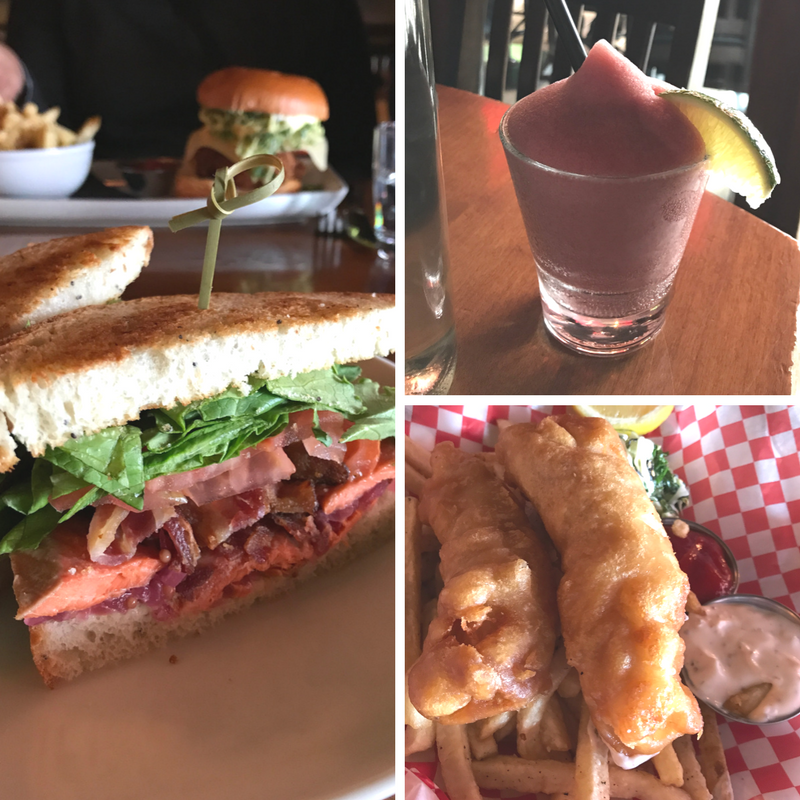 With my family, being one of those share-everything types, I was able to try a good amount from the fried chicken burger to the fish and chips and even a blood orange margarita. Everything hit the spot fuelling our next adventures. Not necessarily legal, and cops are on patrol more so in the summertime so be discrete, I couldn’t not help myself to a local beer on Chesterman Beach during the festive Canada Day weekend. 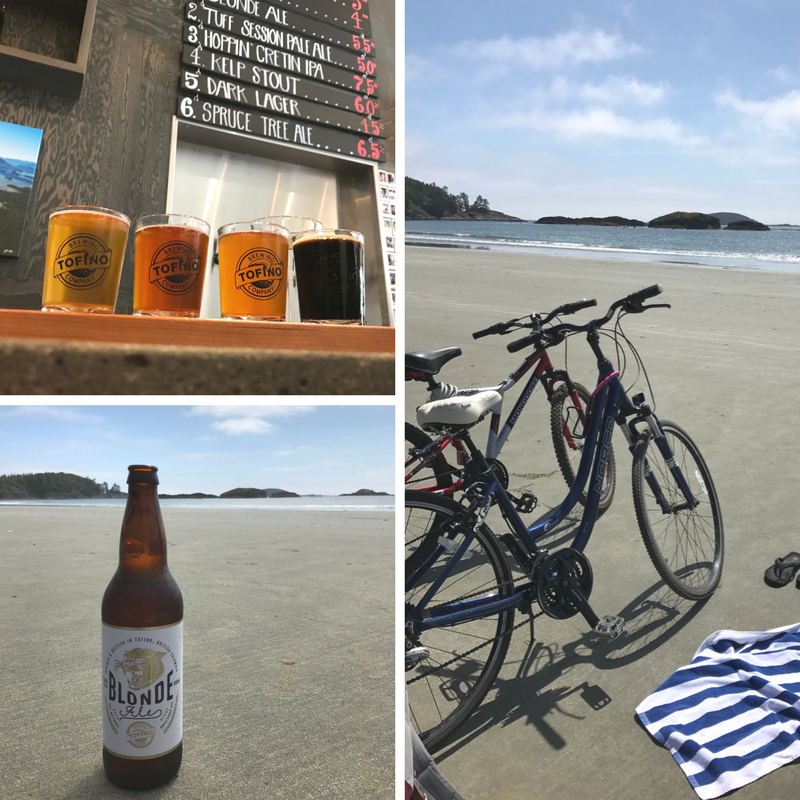 Tofino Brewing Company was a short bike ride from our AirBnB so we spent a considerable amount of time deciding which brew we’d like to take to the beach. With local ingredients like kelp seaweed and spruce, you’ll come away with beers that are influenced by the landscape and unique to your taste buds. Chesterman Beach was a quick rip from the Brewing Co. and is also the perfect biking beach as the sand turns solid and hard like a concrete floor with the occasional dead jelly fish or sea shell. We sat, enjoyed the view and said hello to some other friendly visitors also gasping at Tofino’s beauty. When I was in Tofino I found that the visitors were all in agreeance, Tofino is a Canadian gem. However, the locals kept asking us why we were in Tofino, where the temperatures topped at 20˚C when back in the Okanagan it was a warm 30˚C. Basically, you can’t get views or seafood like this in the Okanagan! As soon as my husband and I arrived at Long Beach Lodge we knew we had stumbled upon a piece of arcadia. The atmosphere reminded us of the most private beaches of Hawaii yet there were no hoards of tourists populating the beaches and outdoor bars. As the summer sun began to set the surfers rushed to the waves catching the last of the day. Dogs and lovers meandered on the sand as the chilling breeze ushered them to hold each other a little closer. As we sat and had a drink at the outdoor bar next to a bonfire with blankets provided we felt like this was a proper holiday. Finally, it came time for dinner. It being a bit chilly in the evenings I opted for pea risotto with freshly caught local ling cod fish paired with an Okanagan Orange wine. I’ve noticed Orange wine has became a bit of a trend here in British Columbia with many local Okanagan wineries participating. They can be a real hit and miss like any trendy wine but this wine from Sperling Vineyards was particularly delicious. It being Canada Day long weekend it was tough to get into a restaurant without a reservation but we were able to snag an outdoor seat with a view of the town. 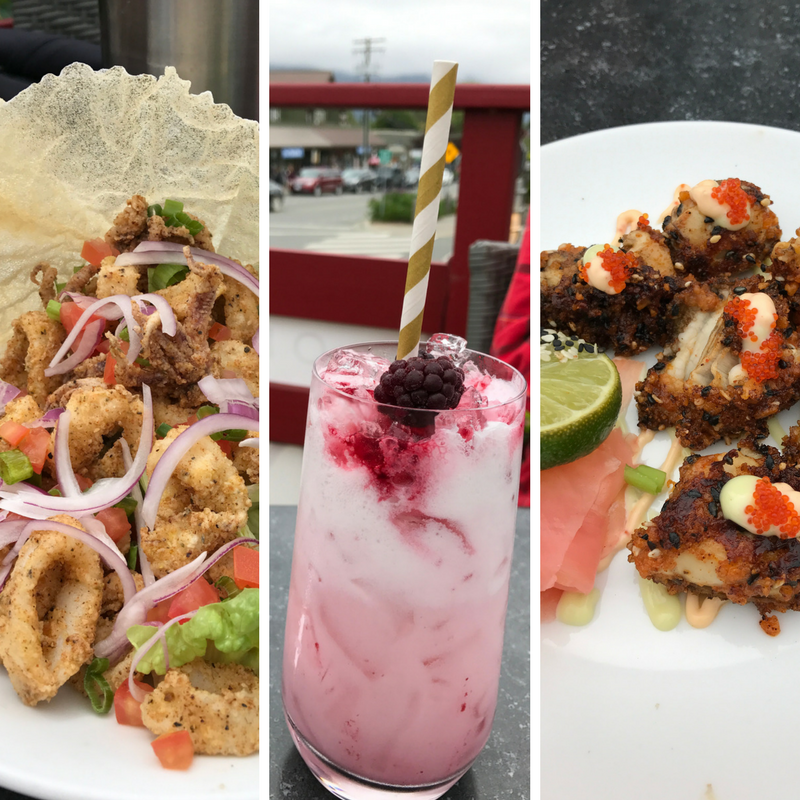 I’m not sure what it is but the calamari in Tofino is some of the best I’ve ever had as were the baked oysters here at The Schooner restaurant – a local establishment since 1969! 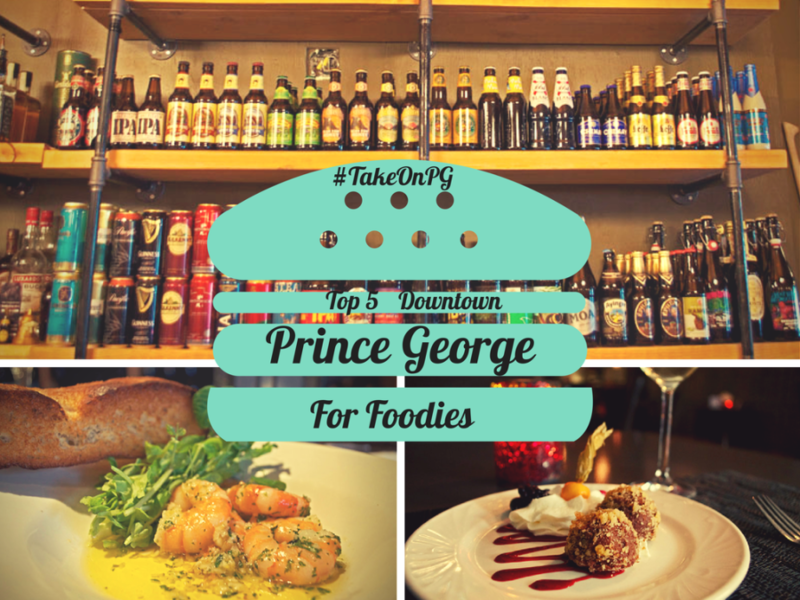 Rhino appears on almost all Tofino foodie lists you’ll find on the internet or Pinterest today and for good reason. 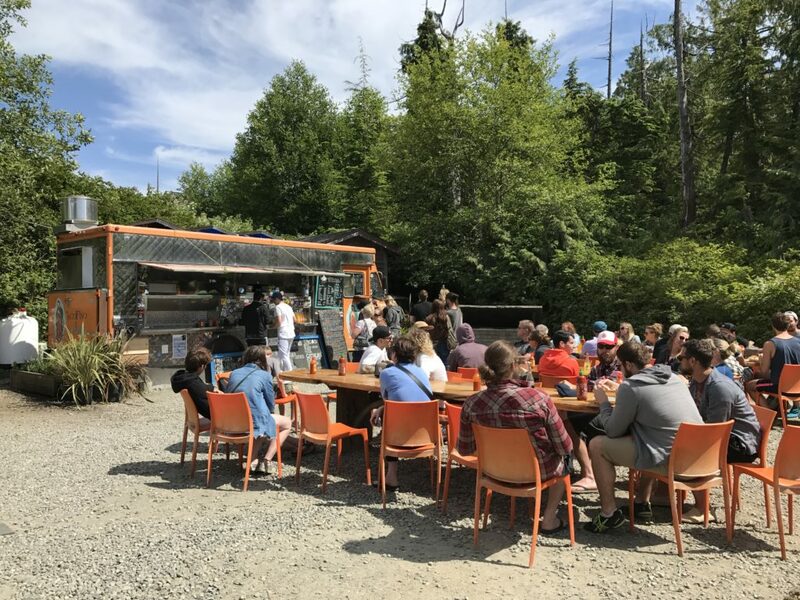 Their coffee is delicious and the donuts offer a not too sweet offering when you get that midday fix after biking the entire town of Tofino. By the way, bike is the best way to get around as parking can be limited and the streets can be extremely busy. Having one of the best AirBnB we’ve ever set foot in with a stocked kitchen we were determined to make our own seafood feast. We roamed the various fish mongers in Tofino finding excellent offerings. We bought crab legs and shrimp from The Fish Store but something pulled us into Trilogy Fish Store on our way back home. There we found the trail end of scallops. We asked if there were any more coming in, they told us it would be ready in an hour. I was a little skeptical I must admit. 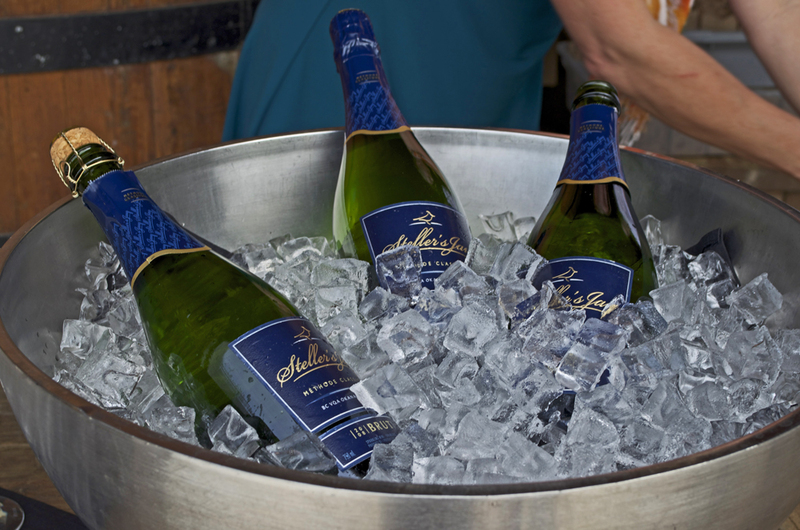 Once we had all the seafood I began preparations on the BBQ with wine in hand. I barbecued the shrimp and some veggies while my mom prepared the crab legs with some Old Bay seasoning. The scallops were pan fried by my sister and were the sweetest little bursts of ocean I have ever tasted. I’ve heard that many restaurants and even some fish mongers soak shrimp and scallops in salted water to bulk them up thus diluting the natural taste. These on the other hand were the real thing, fresh from the ocean out our back door. Along with our fully stocked AirBnB kitchen we also had a fire pit with a garden to play football and bocce. It made for gorgeous starry evenings with Canadian classics like the Tragically Hip gracing my Bose portable speaker. 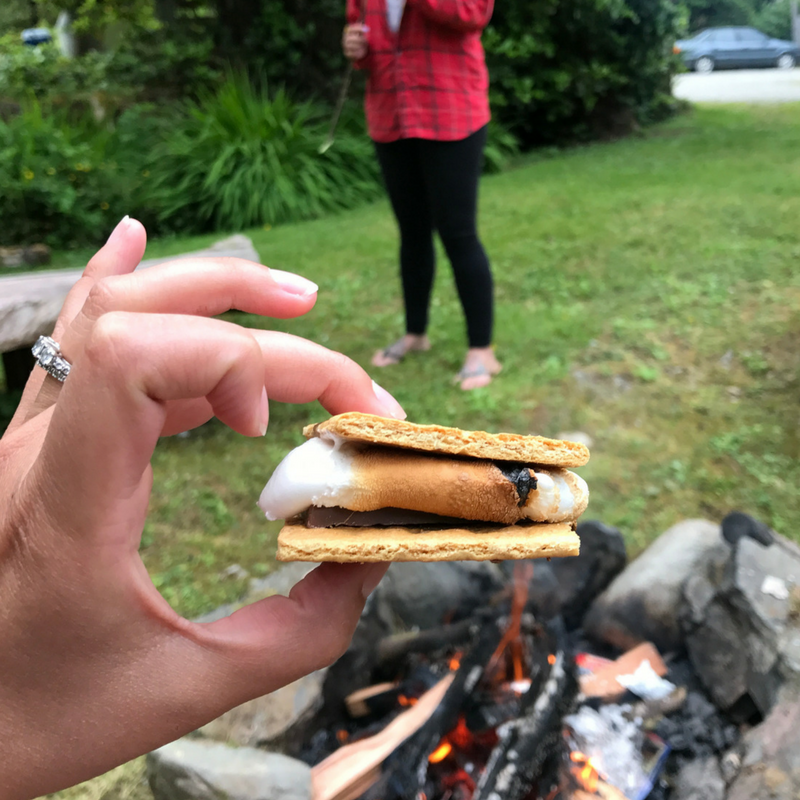 I think S’mores are pretty self-explanatory: Set the marshmallows ablaze then sandwich them between your favourite chocolate and graham crackers! Amirite?! I tried this wine at one of Canada’s top 100 restaurants, The Wolf in the Fog, on a chance encounter. 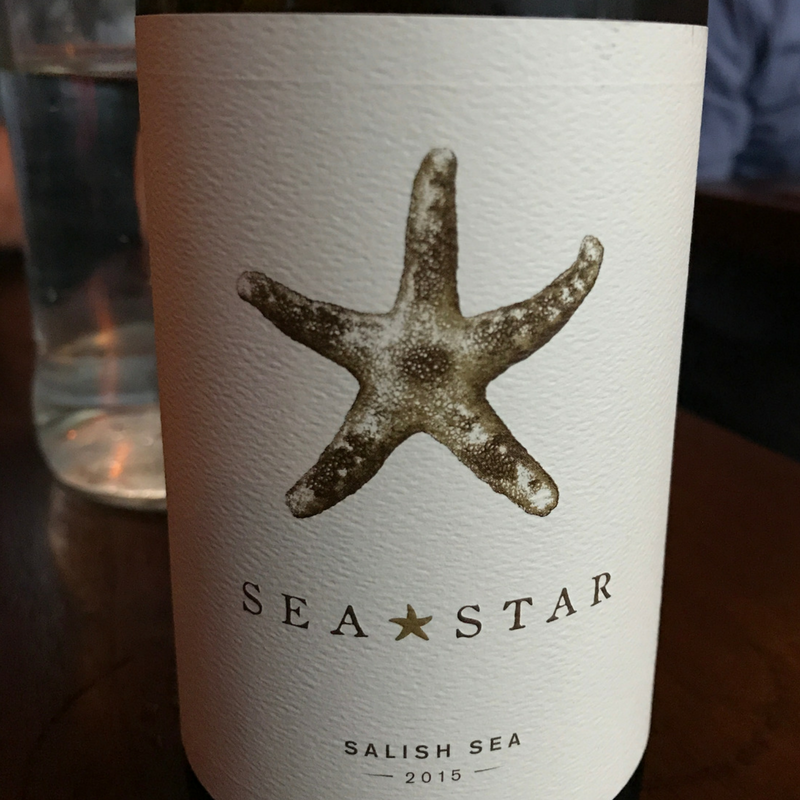 Vancouver and Gulf Islands area hosts many vineyards including my new favourite, Sea Star Vineyards located on Pender Island. Frankly, being from the Okanagan wine region, I’ve been skeptical about Vancouver area wines. But I’m happily swallowing my uncertainty with every sip of Salish Sea. Notes of guava and grapefruit with an herbaceousness that makes my mouth water as I reminisce about this wine as a pregnant woman…this will be the first wine I drink once baby is born! 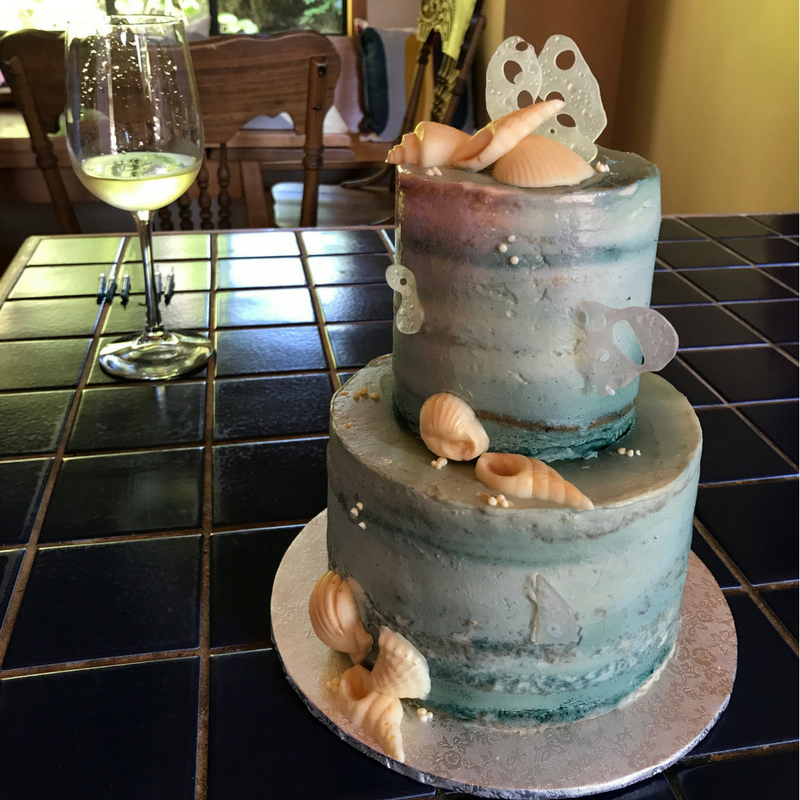 I was surprised by my family with this awesome ocean themed cake suitable for a Cancer like me! Delicious and simply beautiful details! 1. Tacofino, The Best Tacos You’ll Have in Canada! 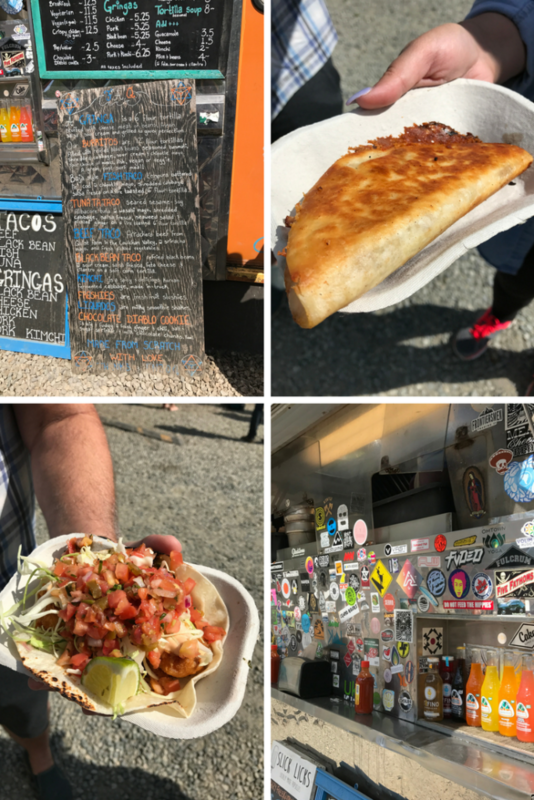 My number one mission coming to Tofino was to have one of every taco at Tofino’s world famous food truck, Tacofino. The tuna was by far my favourite but you can’t go wrong with the complex flavours they are able to layer and stuff into these little tortillas of pure ecstasy . I do not exaggerate! There’s good news if you can’t get to Tofino. In the height of their success they have expanded to various locations in Vancouver and Victoria. I’d love to know what or where was the best meal you had in Tofino?